SCVHistory.com LW2289a | Film-Arts | William S. Hart: 'Tumbleweeds' Lawsuit, 1936-1939. Oh, yeah — THIS is what we did before Photoshop. April 15, 1936 — William S. Hart appears in court in New York on his lawsuit against United Artists for breach of contract. Hart sought $500,000 in damages for the distributor's failure to "exploit" the actor's last film, "Tumbleweeds" (1925) — which we can interpret to mean Hart expected UA to re-release it. Three years later, in 1939, Astor Pictures Corp. re-released the film with a new spoken-word introduction. Associated Press wire service photograph from the archives of the Chicago Tribune. Per the practice in the day, the photo editor glued clips to the back of the photograph indicating when it was used in the paper. The Tribune used this photograph at least twice — once on May 3, 1936, when it ran the story of Hart's April 15 court appearance; and again Jan. 8, 1943, three years before the actor's death, when he announced his intention to bequeath his Newhall ranch property and home to the public. Judging from the clips, the Tribune ran the original, unaltered image in 1936 (with the area below the table cropped out). When it ran again in 1943, the photo editor used a whitish fluid (similar to Wite-Out brand correction fluid) to create a cut-out effect. 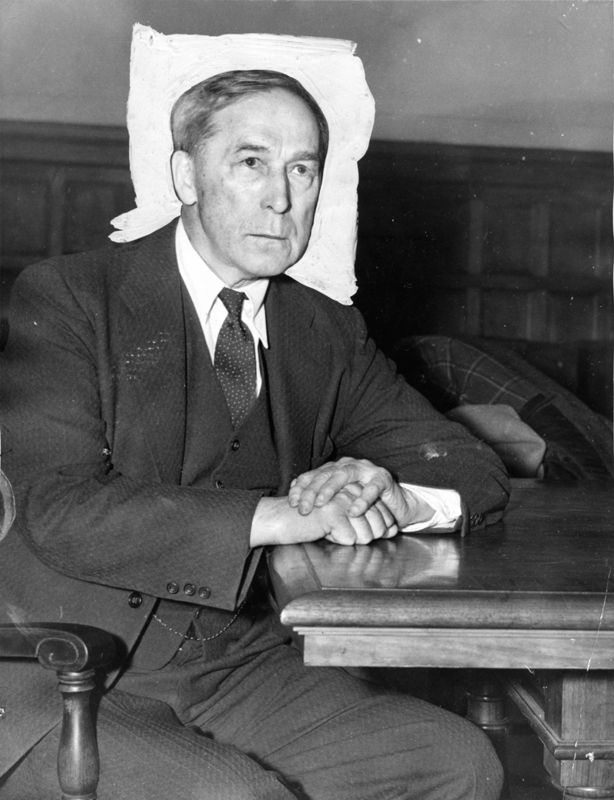 NEW YORK, APRIL 15 — William S. Hart, two-gun man of the silent movies, shown in Supreme Court today at trial of his $500,000 suit against United Artists for alleged breach of contract. He alleges the film company failed to fulfill an agreement to exploit his last picture and that, as a result, he lost the savings he had put into it. Newhall, Cal., Jan. 7 (AP) — Old Bill Hart of the gimlet eyes and blazing guns, thinks he owes a lot to the public and he figures to repay some of the debt. The former western film hero, who used to clean out saloons full of cattle rustlers single handed while youngsters whooped and hollered, disclosed that he intends to bequeath his great, rambling ranch estate in the hills near here to the public upon his passing. Hart, now 72 years old, was in a jovial mood as he left a hospital after a seven weeks' stay during [rest of clip missing]. Conventional wisdom dictates Hart was 78, not 72. He was coy about his age; he started his film career later than most people, having already had a successful acting career on Broadway in the late 1800s and early 1900s. During his lifetime, the press reported his age anywhere from 1864 at the earliest (which is commonly accepted today) to 1872 at the latest, and most often as 1870 (which is why AP says he was 72 in the first part of 1943). We'll never be 100-percent certain; the county records building in Newburgh, New York, burned down in the late 1800s, and the fire took Hart's birth certificate with it. Note: The barcode on the back of the photograph is that of the 2012 photo seller. 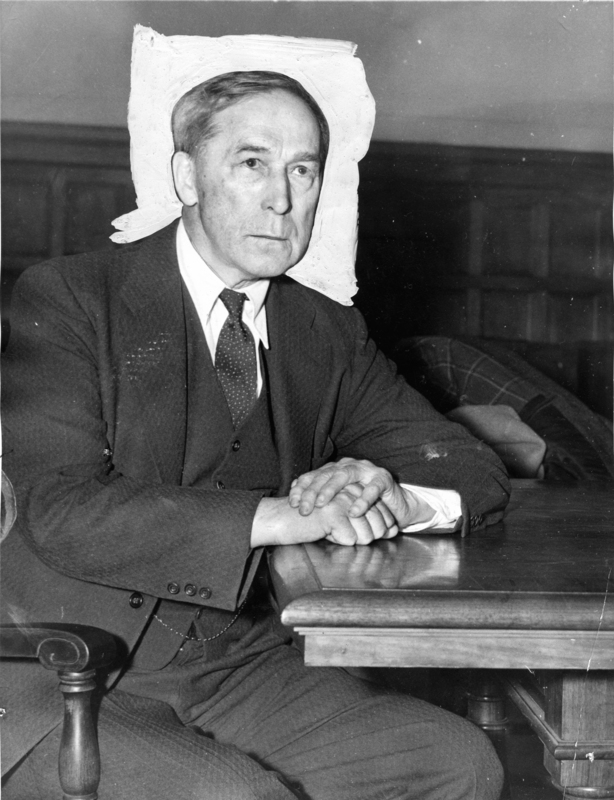 William S. Hart Wins Court Plea. United Artists Loses Appeal on Contract. The Associated Press, as published in The Los Angeles Times | November 18, 1939. 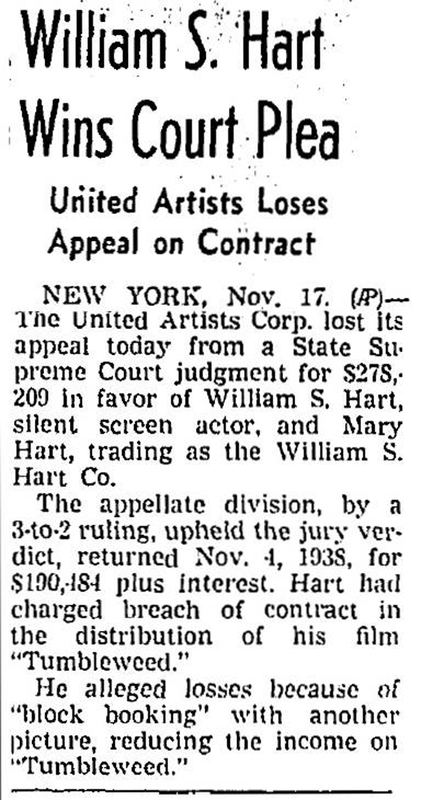 New York, Nov. 17 (AP) — The United Artists Corp. lost its appeal today from a State Supreme Court judgment for $278,209 in favor of William S. Hart, silent screen actor, and Mary Hart, trading as the William S. Hart Co. The appellate decision, by a 3-to-2 ruling, upheld the jury verdict, returned Nov. 4, 1938, for $190,484 plus interest. Hart had charged breach of contract in the distribution of his film "Tumbleweed" [sic]. He alleged losses because of "block booking" with another picture, reducing the income on "Tumbleweed." Wm. S. Hart Wins Tumbleweed Suit. The Newhall Signal | May 24, 1940, pg. 1. At his casa on the hill this week William S. Hart expressed profound satisfaction with the outcome of his suit against United Artists, which he won this week when the New York appellate court affirmed the judgment of a lower court awarding Mr. Hart and his sister Mary a $278,210 judgment. The case has been in the courts for eleven years, having been filed in 1929. The vindication of his claims against the picture company brings to a close the long fight which Mr. Hart has made, and which involved his last and greatest picture, "Tumbleweed" [sic]. In his suit Mr. Hart claimed that Joseph M. Schenck, president of United Artists, had block booked "Tumbleweed" which cost $302,000 to make, with a cheap, $15,000 dog picture titled "Wild Justice" and that the booking had been made in some 7,000 theaters at cheap prices, thus depriving him of the rewards which his prestige and the merits of his picture should have commanded. Besides the suit just won in the New York State court Mr. Hart also filed suit in the federal court, and won his case in the circuit court trial. When an appeal was taken to Judge Manton, it was thrown out. Judge Manton was later impeached, found guilty and given a jail sentence. The judgment will not be all profit to Mr. Hart for the court expenses of the eleven years of litigation have been very heavy. He employed the best lawyers of the East, including Max D. Steur. "I have always felt that I was sold down the river on 'Tumbleweed,'" Mr. Hart declared. "The decision naturally means everything in the world to me." Webmaster's note: "Wild Justice" was literally a "dog" picture, starring the animal actor Peter the Great, a clever German shepherd. The human lead was a young George Sherwood, who had small roles in dozens and dozens of Westerns through the 1950s. The story and screenplay were by C. Gardner Sullivan, who also wrote the screenplay for "Tumbleweeds" — so the pairing made sense on at least one level. Today, "Wild Justice" is probably a lost film. LW2289a: 9600 dpi jpeg from original print purchased 2012 by Leon Worden.